Grand Marshall of the Greater Birmingham Humane Society’s 2019 Jazz Cat Ball Robin Savage with June, one of the GBHS’s rescues. Along with some of her fellow GBHS rescues, June was transported to Humane Society location in Michigan last week to find a forever home. Journal photo by Emily Williams. 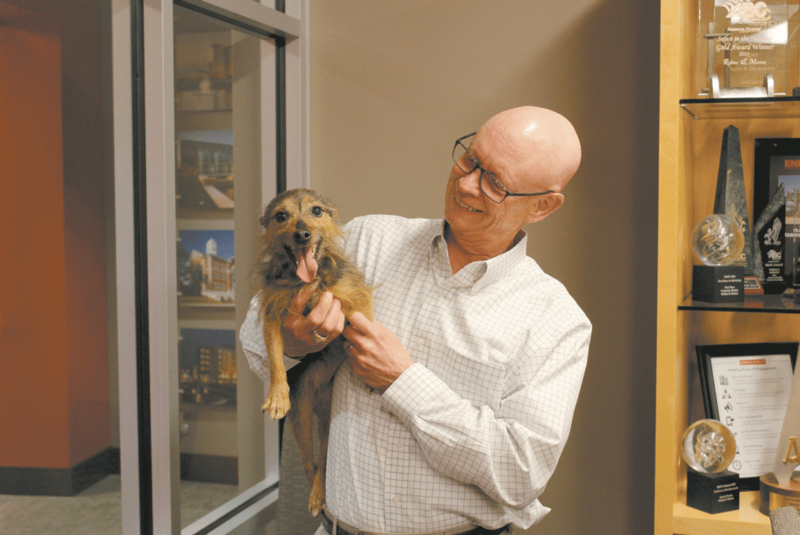 As he finishes his first year on the board of the Greater Birmingham Humane Society, Robin Savage of Vestavia Hills is preparing to be Grand Marshall of the organization’s annual fundraiser, Jazz Cat Ball. The event, being held Feb. 9 at the Sheraton Downtown Birmingham, raises money for an organization in which Savage has become deeply invested. Savage was first formally introduced to the organization through his work at Robins & Morton, a construction and engineering company, when the company was approached to participate in a GBHS capital campaign about five years ago. It wasn’t until last year that Savage decided to get more involved. Seeing the way that serving on the GBHS board of directors had affected Tim Hightower, a business associate and close friend, led Savage to get more involved. Not only has Savage enjoyed his work on the board so far, he is able to use his professional expertise, as president and chief operating officer for Robins & Morton, to help the organization search for a new facility. For Savage, it has been easy to get invested in his work with the organization because he is a lifelong dog owner and lover. He’s had a dog in the family ever since he was about 4 years old, save the years he attended Auburn University to get his bachelor’s in building construction. Even then, he had a dog waiting for him at his parent’s house. Charlie, his dog now, is an Australian shepherd and the current “greatest dog in the world” according to Savage. Raising a dog is also a great learning experience, Savage said, that gives a newly married couple the opportunity to tackle a new level of responsibility. It’s a task both of his daughters have experienced, giving him three granddogs that he cherishes as well as his own. One of his daughters has Scout, who Savage says is the most athletic, energetic Labrador retriever he’s ever seen. His other two granddogs, Macy and Maddie, are more laid-back golden retrievers. Having such a soft spot in his heart for animals, Savage said it was easy to become emotionally invested in his work with the GBHS. One of the major triumphs he’s seen in the organization over his past year of service is the addition of the Yes Save program. Through the program, people who come to the facility to surrender pets are taken to one of the organization’s pet counselors to discuss their issues with their pet ownership. If they are surrendering the pet because they can’t afford to spay or neuter it, the GBHS can handle that. If they can’t afford pet food, the center has a Pet Pantry Assistance program for which the owner may qualify. If they can’t pay their pet’s medical bills, there could be a solution to that. “They find the root cause and they try to solve it so that pet can stay in its home,” Savage said. “I think the figure is about 1,000 animals this year that would have been just dropped off are now still with their owners. Money raised through the Jazz Cat Ball goes to operational costs, helping the organization properly care for the animals it houses and provide services such as Yes Save. In addition, the event will include a Fund the Need fundraiser to raise money to buy a new Tara – transport, assist, rescue and adopt vehicle – for the GBHS. The organization’s current vehicle is worn out from performing its many tasks as a traveling clinic, a traveling pet adoption site and animal transport. Guests attending the Feb. 9 event at the Sheraton Downtown Birmingham, hosted by the GBHS Auxiliary, have a variety of festivities to look forward to. The evening will include a cocktail hour and silent auction, followed by a seated dinner. After a post-dinner live auction, casino games will begin as well as dancing to music by The Downtown Band. Tickets start at $250. For more information, visit gbhs.org/jcb19.